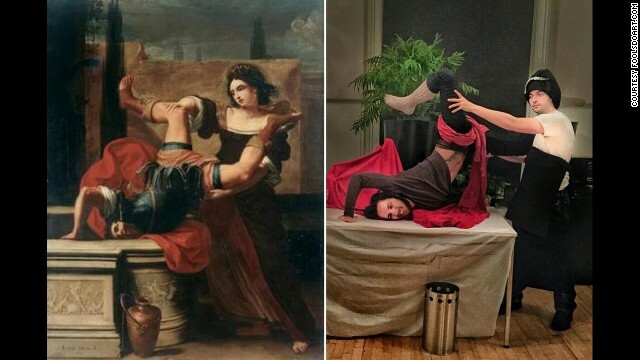 Recreating "Timoclea uccide il capitano di Alessandro Magno" by Elisabetta Sirani, 1659, required some athletic contortions. Click through the gallery for more examples of classic art reimagined by Chris Limbrick and Franscesco Fragomeni for the FoolsDoArt project. "Thinking About Death" by Frida Kahlo, 1943. 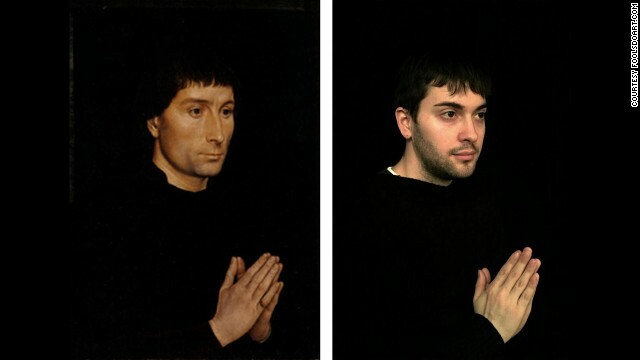 "Tommaso di Folco Portinari" by Hans Memling, circa 1470. 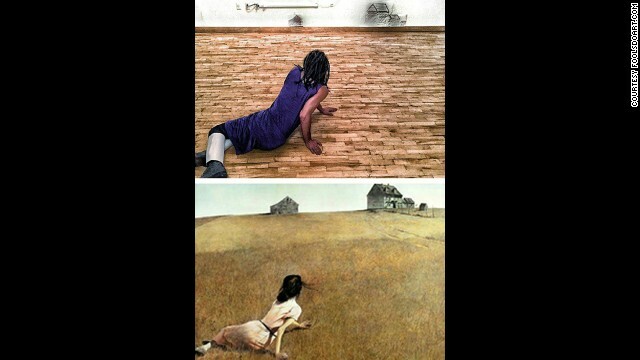 "Christina's World" by Andrew Wyeth, 1948. "Christ's Appearance to Mary Magdalene After the Resurrection" by Alexander Ivanov, 1835. 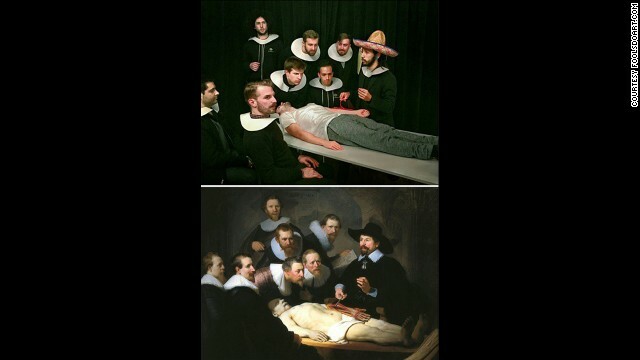 "The Anatomy Lesson of Dr. Nicolaes Tulp" by Rembrandt, circa1632. "Blonde Beauty" by Walt Otto, circa 1950s. 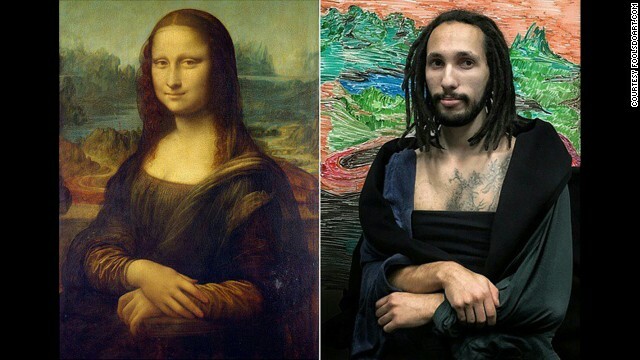 "Mona Lisa" by Leonardo da Vinci, circa 1503-1506. 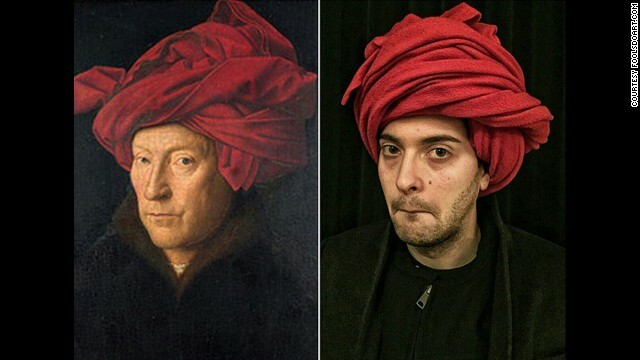 "Portrait of a Man in a Turban" by Jan van Eyck, 1433. 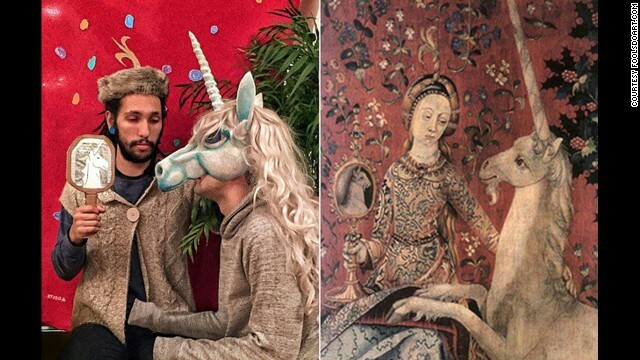 "Lady and the Unicorn: Sight" tapestry, circa 1500. "The Old Guitarist" by Pablo Picasso, 1903. 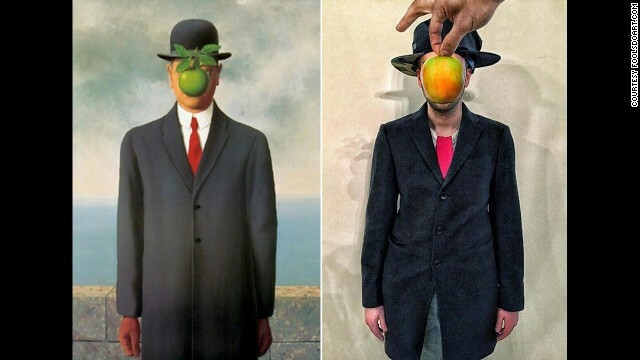 "The Son of Man" by Rene Magritte, 1964. 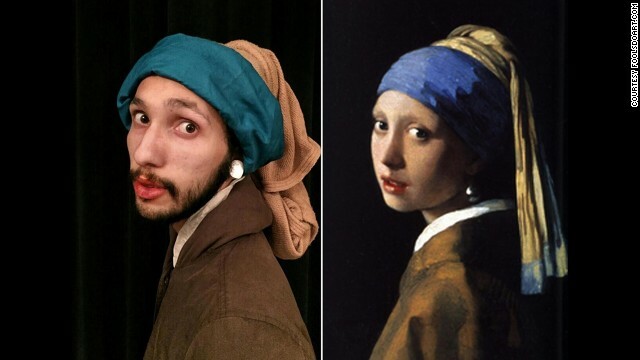 "Girl With a Pearl Earring" by Johannes Vermeer, 1665. "Two Ballet Dancers" by Edgar Degas, circa 1879. 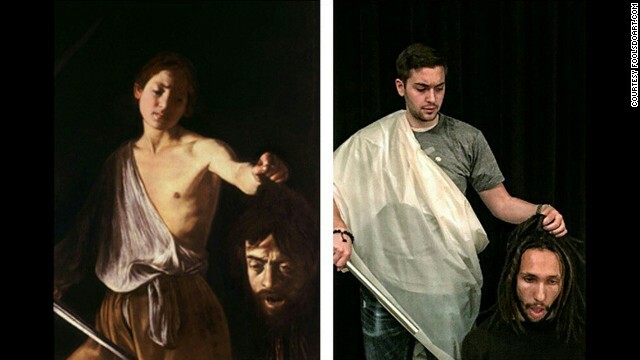 "David with the Head of Goliath" by Caravaggio, 1610. 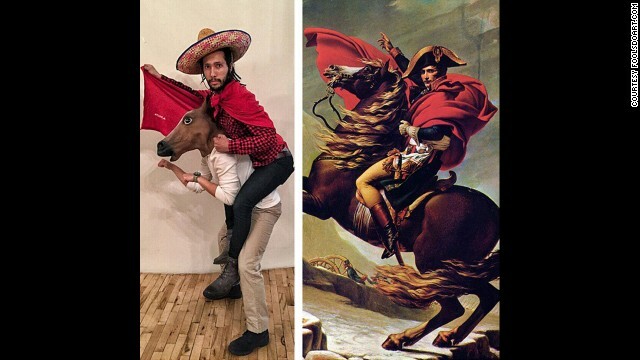 "Napoleon Crossing the Alps" by Jacques-Louis David, circa 1800. "The Creation of Adam" by Michelangelo, circa 1508. 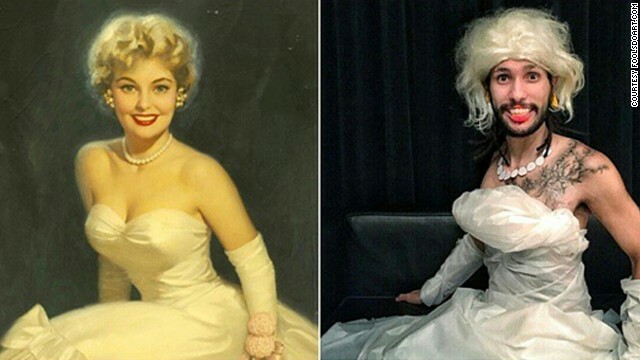 (CNN) -- Goofing around in the office has been taken to a whole new level by a couple of guys who work for Squarespace, a website creation company in New York City. 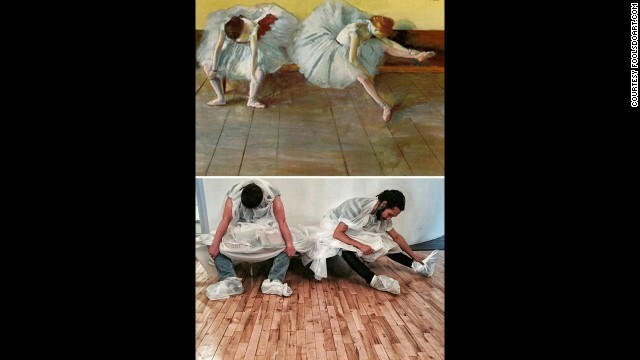 Chris Limbrick and Francesco Fragomeni started making what they call "painting remixes" in early November. 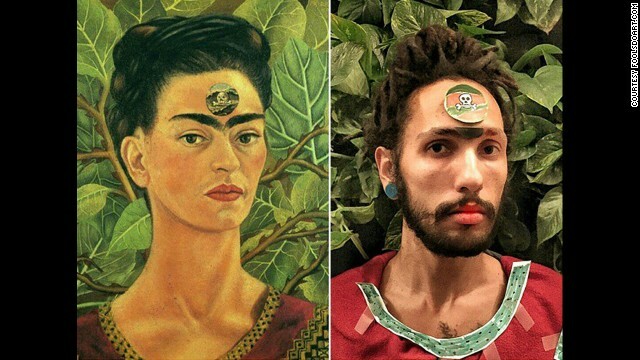 The side-by-side mashups of everything from Michelangelo's "The Creation of Adam" to Frida Kahlo's 1943 self-portrait "Thinking About Death" have gathered thousands of followers on their website, Tumblr and Instagram pages. The project they've dubbed "FoolsDoArt" began on a whim, and got an unlikely assist from Limbrick's mother. 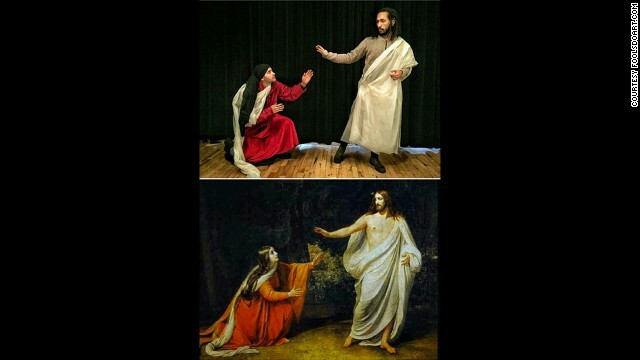 "We were sitting around with some friends at work and we randomly ended up reenacting a scene from the Sistine Chapel," the pair wrote in an email to CNN. "One of our coworkers pulled out her phone and took a picture which we thought was funny but we didn't initially think anything of it. 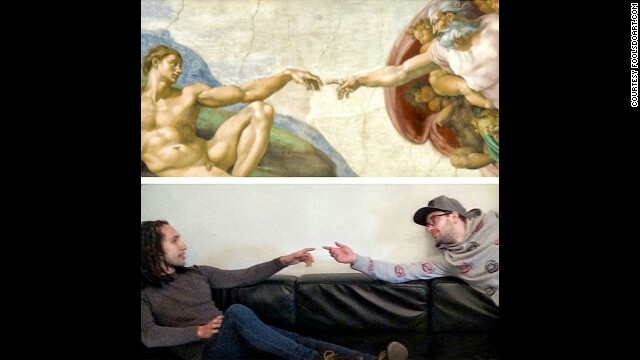 Chris texted the photo to his mom, who then stitched our shot together with a photograph from the actual Sistine Chapel and texted it back to Chris." 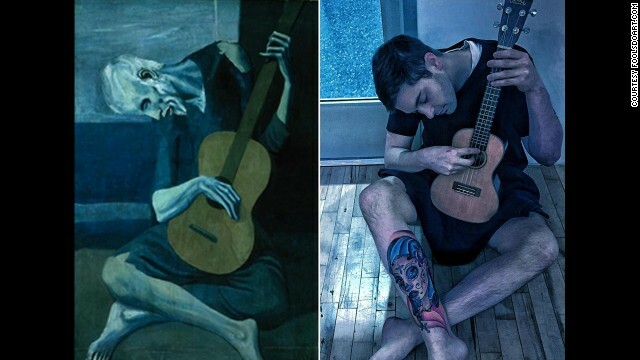 Thus began a quest to recreate some of the most iconic works of art in the world in their downtime at work. Michelangelo's "Creation of Adam". Sistine Chapel. The rules: They can use only props that are available in the office and any photo editing must be done on their smartphones using apps like Snapseed, Diptic, and Square InstaPic. "We really enjoy the DIY look of the photos so we also made a rule against using Photoshop," the pair said. Both men are art lovers and avid photographers outside of work too. Fragomeni was printmaker specializing in antiquarian photo-chemical printmaking processes before moving over to the tech field. So they've got some background in creating beautiful things. They've also got access to much cooler office supplies than your average cubicle dweller. Squarespace is a creatively fertile workplace, they say, and you never know what's lurking around, waiting to be incorporated into a photo shoot. "There's always lots of strange stuff sitting around," they wrote. "Some of it has been left from past Halloween costumes and some has just randomly appeared. The unicorn mask was a mystery for a long time. No one knew where it came from. We found out recently that it belongs to a coworker in another department who brought it over a couple years ago." Their bosses are supportive, and the shoots are a small part of their workday. It can take anywhere from 10 to 30 minutes to do one recreation, "depending on how complex the image is and how creative we have to get with the costumes." Colleagues have been eager to get in on the fun by posing, assisting and lending clothing and props to the project. You can help too: The guys are taking idea submissions via their website. Maybe a little Jackson Pollock abstraction next?